Haridarshan Resort is an eco-friendly resort situated at an elevation of 2057 mts above sea level at Bigul in Bageshwar district of Uttarakhand. The Resort is covered by vast area of thick forest, suitable for trekking jungle walks. Breathtaking views of the snow-laden Himalayan range and verdant Kumaon valley is seen from the private balconies of the rooms. Experience the best of serenity and exquisiteness by planning a stay at Haridarshan Resort in the lap of nature. 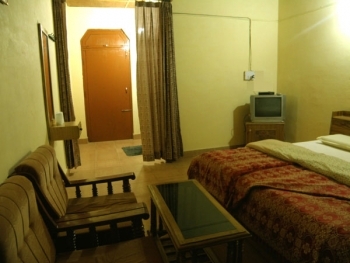 The resort is equipped with modern amenities, ensuring a comfortable stay to the guests. 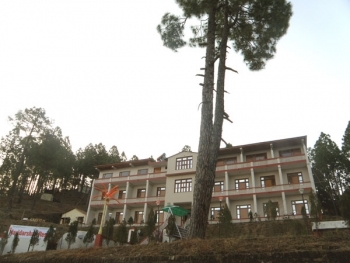 HariDarshan resort is located just 15 kms before Chaukori on Bageshwar-Munsiyari road. Vijaypur is 2 Kms from Haridarshan Resort, Dholinag Temple is 1 Kms. Trek, Bhadarkali Temple is 2 hours trek or 30 kms by road, Kanda is 8 Kms, Chaukori is 15 Kms, Bageshwar is 32 Kms, Berinag is 27 Kms, Baijnath is 50 Kms, Gwaldam is 72 Kms from the hotel. Hotel Haridarshan Resort provides with a choice of 22 well-furnished rooms in the categories of Honeymoon Jungle Cottage, Executive Room, Deluxe Room, Semi deluxe rooms and Standard Room. All rooms and cottages are well appointed and supplied with 24 hrs of running hot and cold water. A variety of delicious meals are served at Hari Darshan Resort. The food is prepared by using healthy and fresh vegetables. - Kids Play Area for Indoor/ Outdoor games as TT, Badminton, Carom, Chess. - Various indoor and outdoor games and many more. - 1 or more Session of village/ forest trek. A charge of 50% is levied on booking cancelled within 21 days of expected arrival of the Guest. 100% cancellation charges on no-show/ early check out or booking cancelled within 10 days of arrival of the guest at our Resort. Haridarshan Resort in Bigul is well-connected by motorable road. Roadways buses are directly available from Delhi, Kathgodam and Haldwani. Bigul is a small Village just before Chaukori in Bageshwar District. It is a well known hamlet from British period for its salubrious climate and natural beauty, which is approx 165 Kms from Nainital, 66 Kms from Kausani, 88 Kms from Binsar & 110 Kms before Munsyari. Patal Bhuvaneshwar is 52 Kms from the resort. By train : Nearest Railway station is in Kathgodam which is 195 kms. from Haridarshan Resort, Arrive Kathgodam by overnight train (Check train schedule). From Kathgodam take taxi to the Resort. By Flight: Nearest airport is Pantnagar which is 220 kms. from Resort, but presently no regular flight from there.